We deliver across Spain's Costa Blanca and Costa Calida including Región de Murcia International Airport (Corvera) and from San Mazzaron to Alicante Airport and all small towns and Urbanisations in between. If you are staying in this area and it is not mentioned above, please e-mail roy@kideasenurseryhire.com or call +34 966 764 267 to check whether we can help. 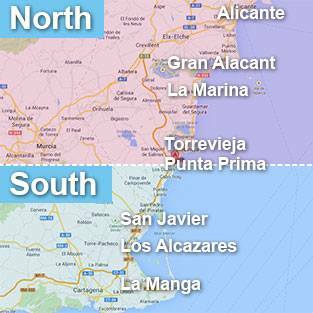 All areas from and between Punta Prima to La Manga including Región de Murcia International Airport (Corvera). If you are staying in this area and it is not mentioned above, please e-mail mick@kideasenurseryhire.com or call +34 690 230 538 to check whether we can help.